George Koppelman and Daniel Wechsler’s discovery was announced in The New Yorker magazine in April 2014, and the two antiquarian booksellers were met with quiet encouragement and loud skepticism. 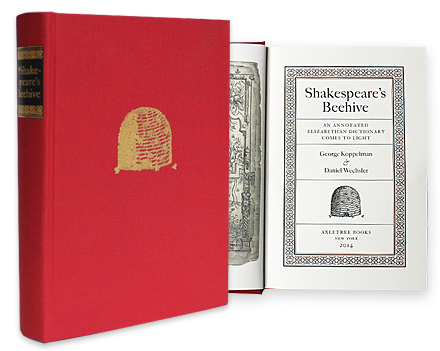 They’ve pressed forward more confident than ever, honing their claim with a revised and expanded edition of Shakespeare’s Beehive: An Annotated Elizabethan Dictionary Comes to Light, in which the story of its acquisition and the journey that led to its identification is presented with further evidence and new discoveries throughout, as well as two additional chapters. It is due for release on October 1, 2015. “A second edition became a necessity as a result of research that we conducted over the course of the past year, evidence that we believe is important to share, and helps to solidify and advance the credibility of our arguments and our claim.” The object of their seven-year study is a heavily annotated copy of John Baret’s Alvearie, or Quadruple Dictionary, printed in London in 1580. Baret was in effect the standard English dictionary of Shakespeare’s schooldays, and must have had powerful influence in shaping the English definitions of Shakespeare’s generation. But it is not likely that Shakespeare would have preserved the patterns so accurately if he had not himself turned many a time and oft to Baret for his varied synonyms. Free sample material from their study. George Koppelman (Cultured Oyster Books) and Daniel Wechsler (Sanctuary Books) have each spent more than two decades working with rare books. Each is a member of several respected rare books organizations, including The Antiquarian Booksellers’ Association of America, The International League of Antiquarian Booksellers, and The Grolier Club. Through their respective businesses, Koppelman and Wechsler have catalogued thousands of books, and manuscripts, spanning all fields and time periods. Occasionally the two firms have combined forces on cataloguing projects, none as significant, or as spectacularly time-consuming, as their unique copy of Baret’s Alvearie, or Quadruple Dictionary, published in London, 1580. 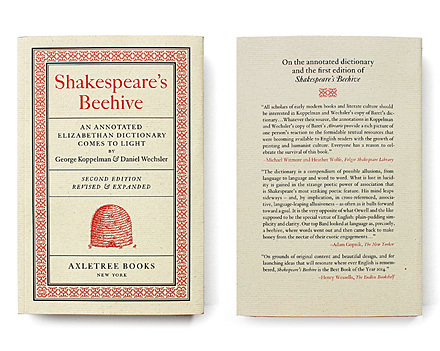 Shakespeare’s Beehive: An Annotated Elizabethan Dictionary Comes to Light. Second Edition, Revised & Expanded.